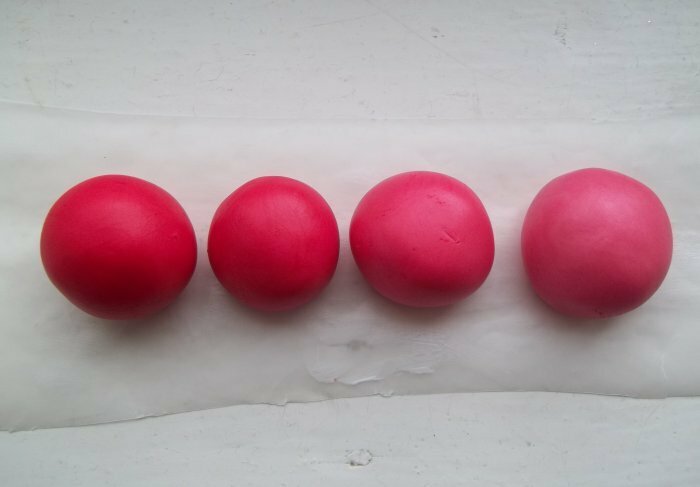 Cold Porcelain is air-drying modelling clay that can be easily made at home (for recipe & instructions click here). When dry it has the translucent quality that looks similar to porcelain. 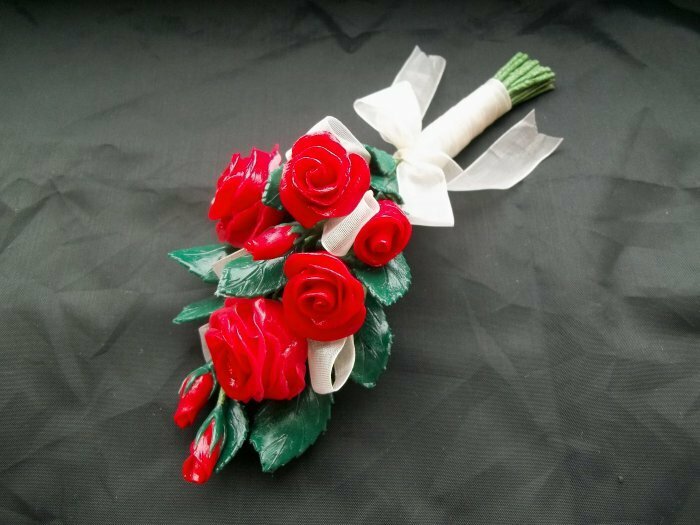 This type of clay is best used to make fine detail flower arrangements such as displays that would adorn a wedding/celebration cake. The clay can be coloured by mixing with a little acrylic paint, and the final display must be protected with Mod-Podge/clear acrylic varnish when dry. 1. 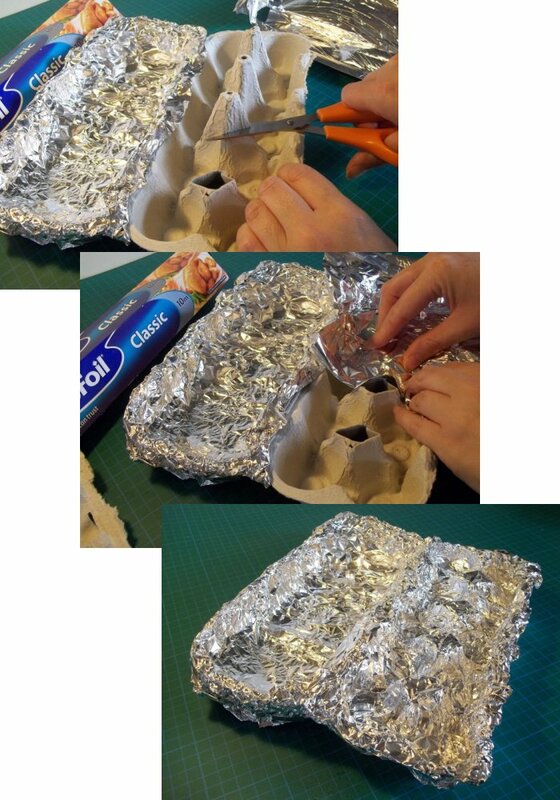 Cover the egg box with some foil, shaping it so as to hold the flowers while you shape the next petal. 2. 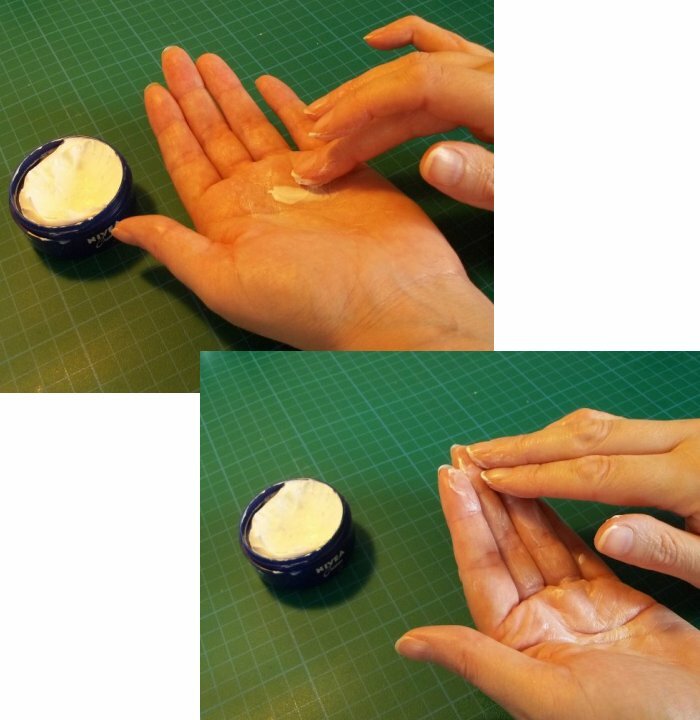 Rub a little moisturiser in your hands and especially the tips of your fingers (you will need to do this regularly to stop the clay from sticking to your hands). 3. If you are going to colour the clay, take the amount you are going to use and add a drop of acrylic paint. Knead with your fingers until the colour is completely mixed in (remember to moisturise your fingers to stop the clay sticking). Keep adding a little more paint and mixing it in until you have the colour you desire. Remember to protect the clay from drying out by keeping it in a sealed sandwich/freezer bag. 4. 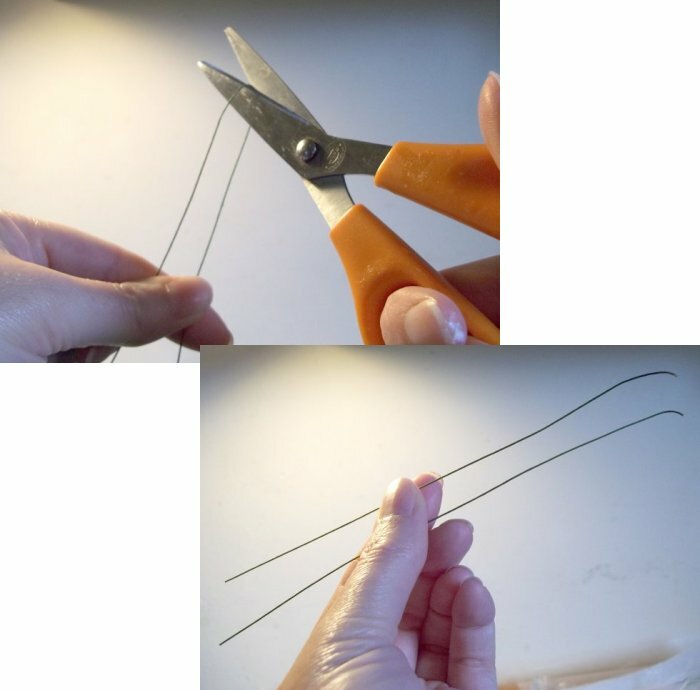 The wire is usually sold in about 14 inch lengths, so cut them in half, into more manageable lengths (unless you want to keep the wire longer). 5. 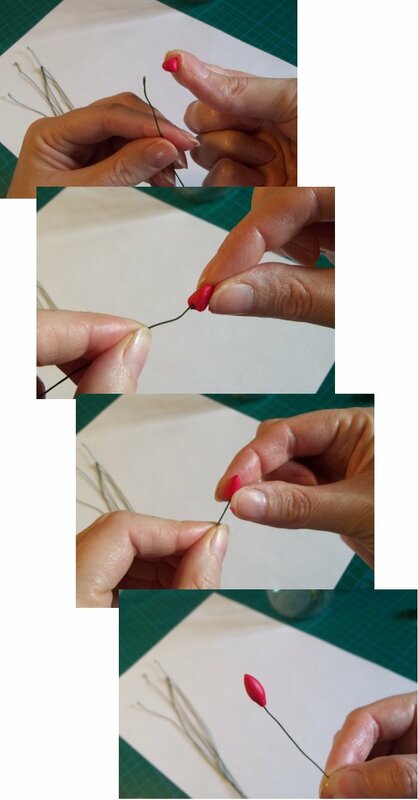 Make a small hook at one end of the wire. 6. 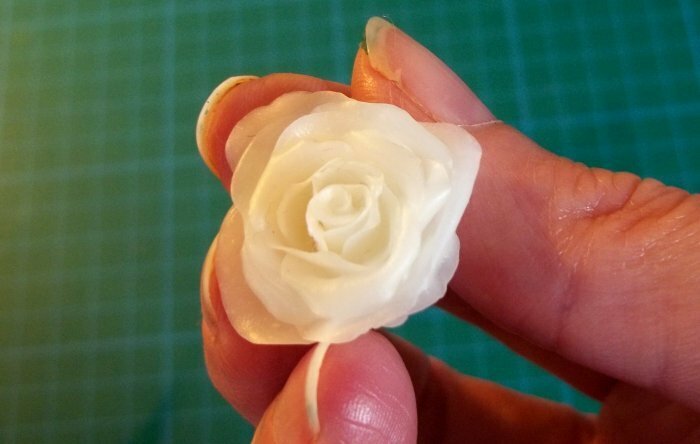 Mould a piece of clay into a cone shape over the hook (the size of cone will determine the size of rose). Make sure the hook is secure in the cone and that there is no gap at the base. 7. 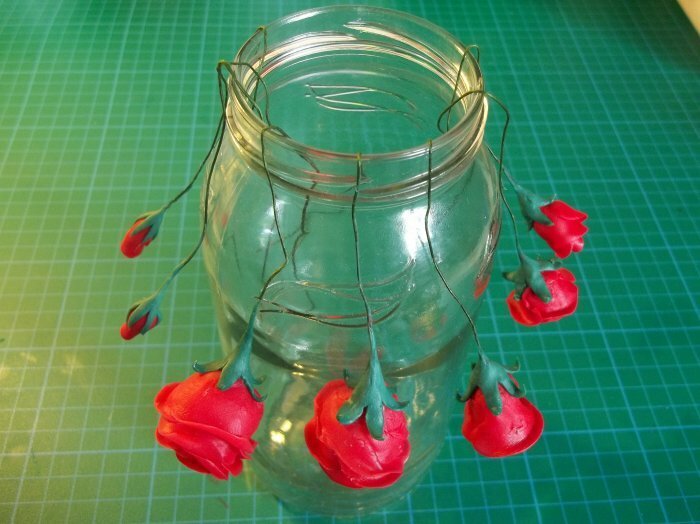 Hook the wire over the glass jar and leave to dry overnight. 9. 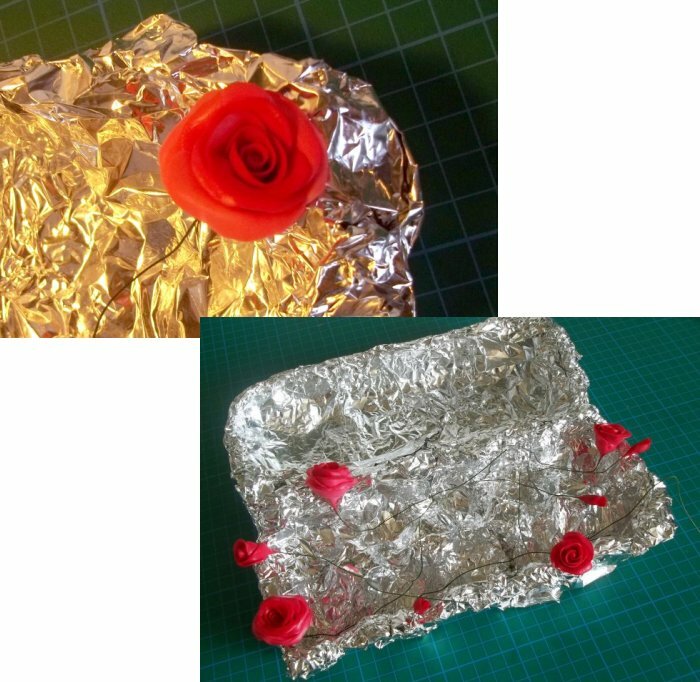 Wrap the petal around the cone leaving a small opening at the top (carefully lay the flower on the foil covered egg box between placing petals). 10. 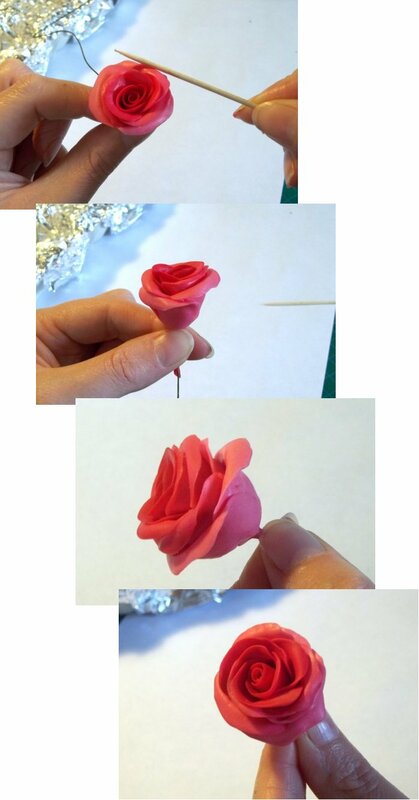 Make another petal and wrap around the cone again, overlapping the last petal, leave one side of the petal open. 11. 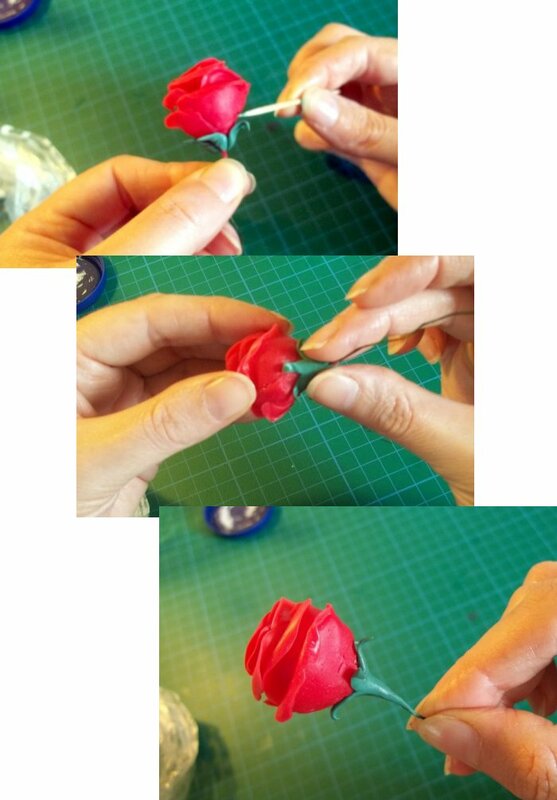 Make the next petal and tuck it inside the open side of the previous petal. 13. 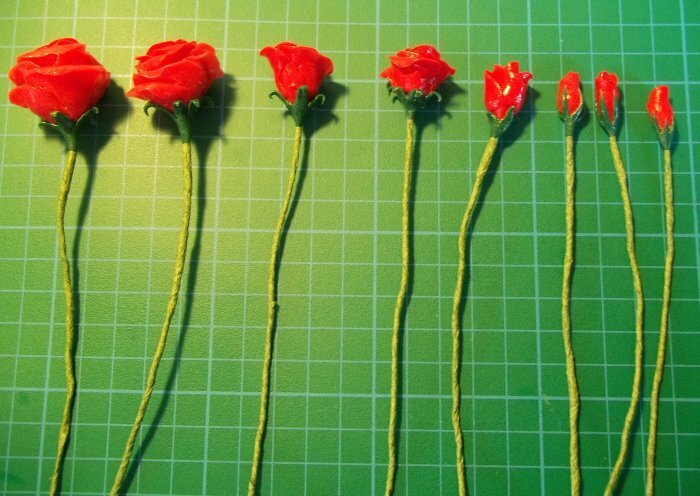 Use a cocktail stick to gently bend and curl back the outer petals. 15. Calyx - Colour some clay with a little green acrylic paint and remember that any clay you don't use straight away should be kept safe in a moisturised sandwich/freezer bag. 16. Shape 5 small cone shapes and between your moisturised palm and fingers, flatten and shape one end of each cone to a point. 17. 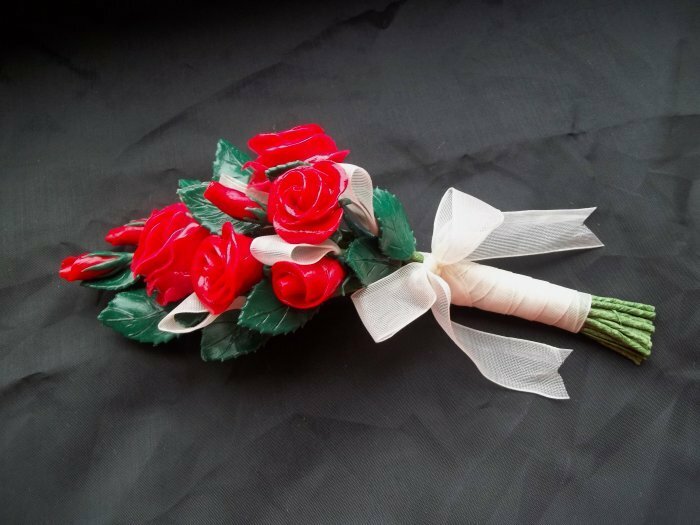 Place them one at a time in a circle around to the base of the rose, with the thicker part of the cone at the base (the flower is dry so it is okay to hold it gently by the rose part while fitting the calyx). 18. Carefully curl the points back slightly with a cocktail stick. (for small bud roses - the whole of the calyx fits snugly against the rose). Smooth the joins and tidy the base of the calyx with your finger, adding a little more clay if you need to, blending it to the wire. 19. 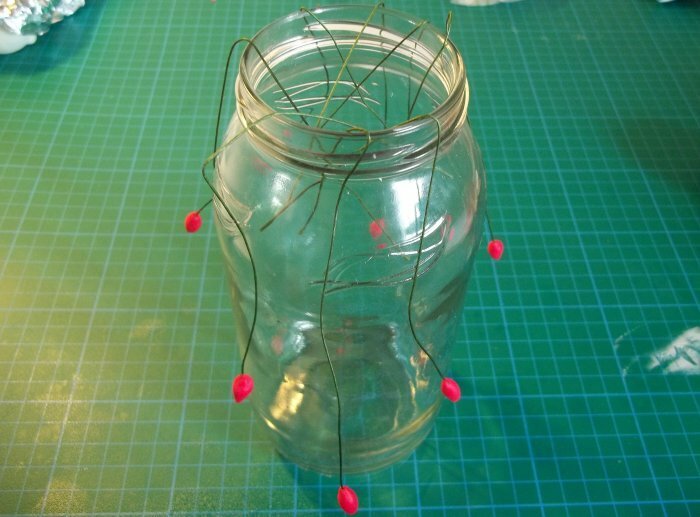 Hook the wire over the glass jar and leave to dry overnight. 20. 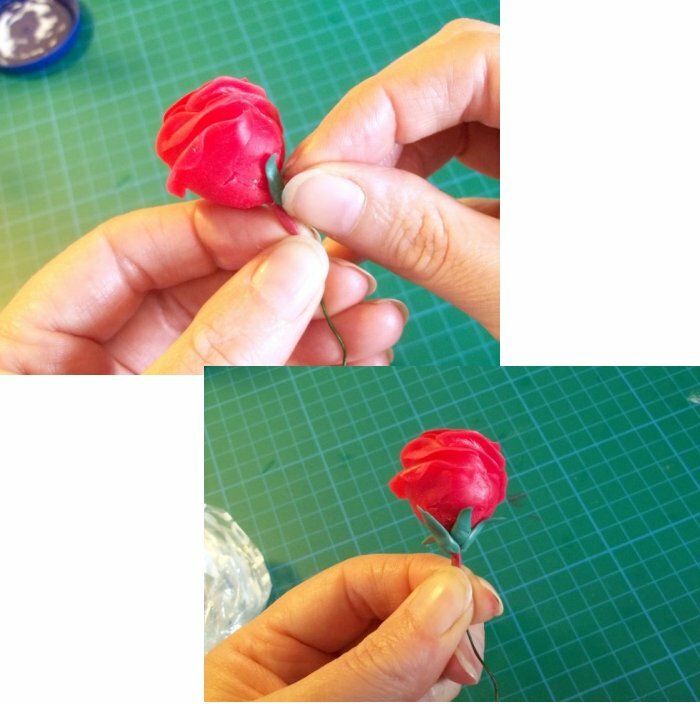 When the flowers are completely dry, seal and protect them with Mod-Podge or clear acrylic varnish (make sure to get into all the nooks & crannies, covering the flower & calyx completely) and leave to dry. 22. Cover work surface & rolling pin with wax paper, spread some moisturiser over them. Roll out some clay and cut out - remembering to apply moisturiser to all cutters and surfaces etc to stop the clay from sticking. Lightly draw on some vein details with a cocktail stick. 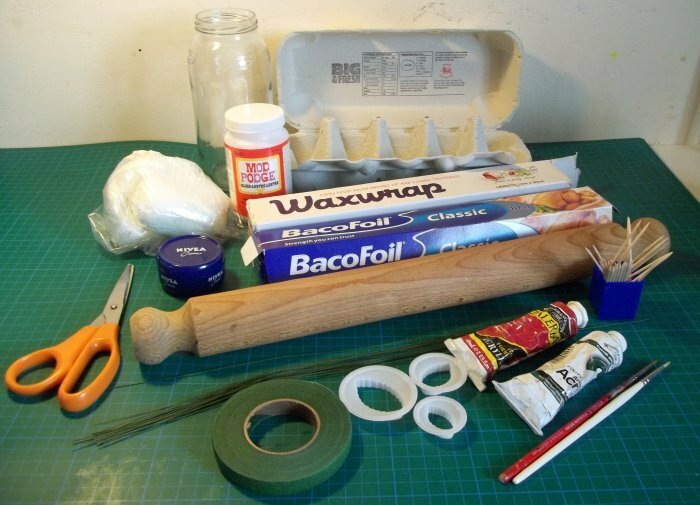 Do not try and take the leaves off the paper, leave them to dry on the wax paper, to give them extra shape & interest place the paper over a curved surface (such as a rolling pin) and leave to dry overnight. 23. After the over night drying you will find that they are dry & peel easily off of the wax paper. They will probably be a little flexible, this is quite normal at this stage. 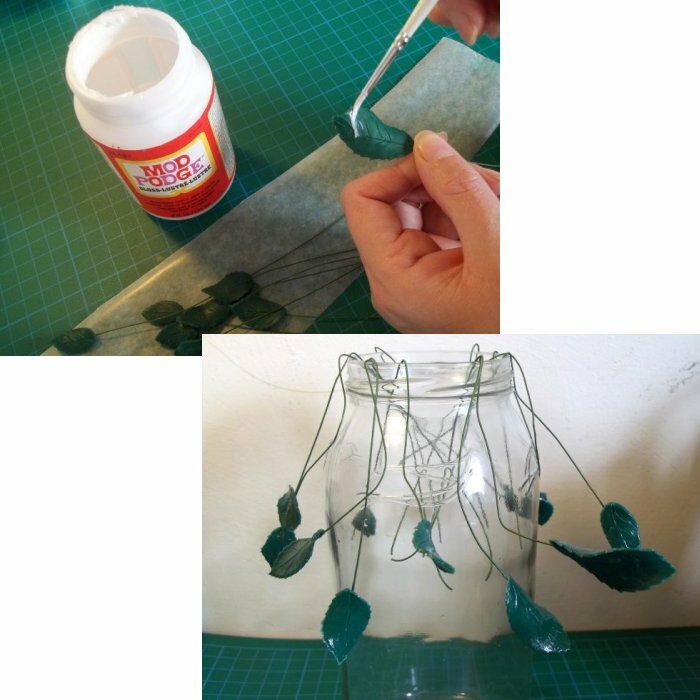 Curl the ends of some wires and place them on the back of each leaf, securing in place with a little green coloured clay and leave to dry. 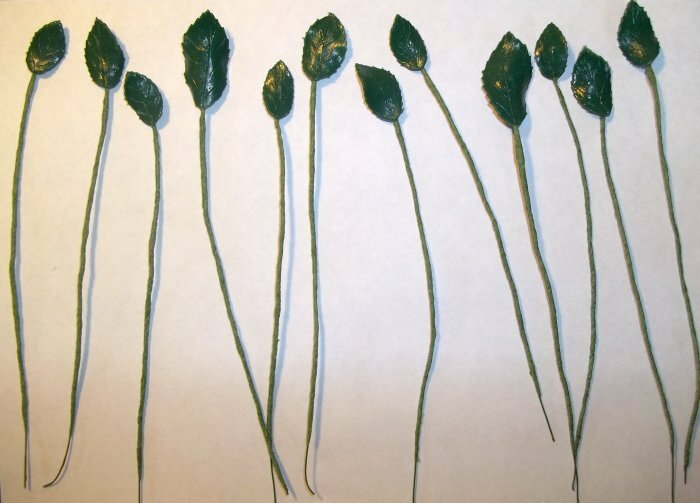 As the clay dries it shrinks slightly, this will alter the shape of the leaves giving them more life. Leave them overnight to dry. 24. When the leaves are completely dry, seal and protect both sides of the leaves with Mod-Podge or clear acrylic varnish and leave to dry. 25. Cover the wires of the flowers and leaves with the florist tape - Florist tape has a shiny and a dull side, place the shiny side against the wire, you need to pull the tape slightly as you wrap it around the wires to get it to stick, and also twist & smooth it with your fingers at the same time. 27. 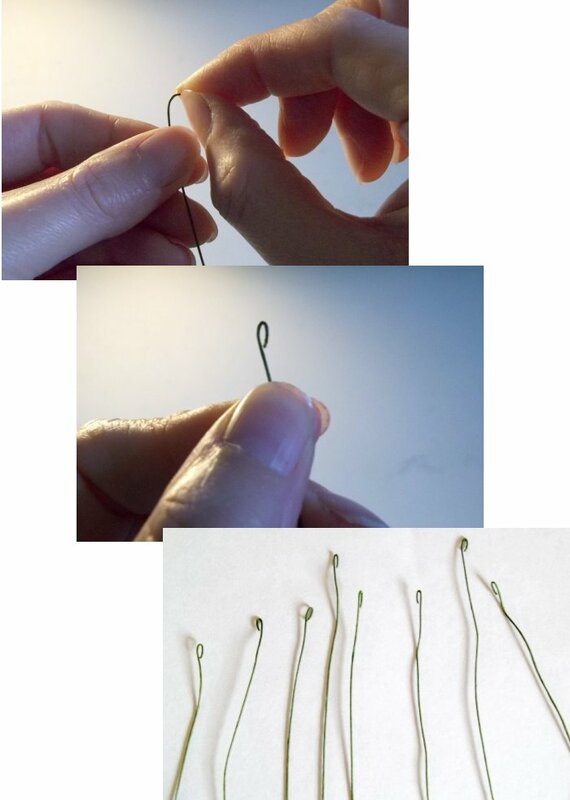 Assemble your floral arrangement by joining the flowers and leaves etc together with the florists' tape.